Chad Alice Hagen: It's About Time...and Space. I am pretending that I have never made such a thing as a new years resolution that went something like ... "I will write a blog post every single week for the rest of my life." Instead, I will just put my feet up, start again and let my catholic school girl guilt ooze out of my pores and out of my system forever. And at least I always have something new to write about - something that I'm excited about. 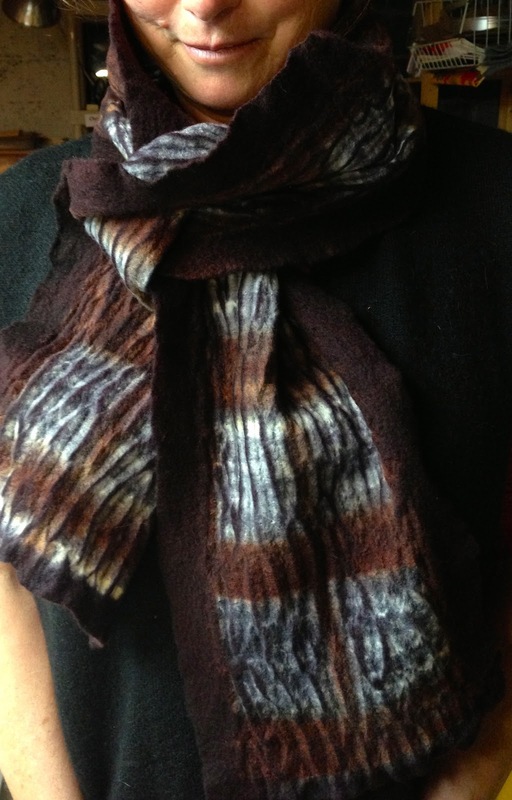 This time I'd like to mention my four upcoming Scarf Making Workshops in 2013. I have been teaching felt scarf classes since time began and even managed to write a pretty nice book about it with master felted Jori Johnson a few years ago. But since my life for a few years has been involved with resist dyeing on the felt, I decided to make some changes in the scarf class to make it more interesting. First is the use of resist blocks to provide exciting under color for the MOKUME scarf. 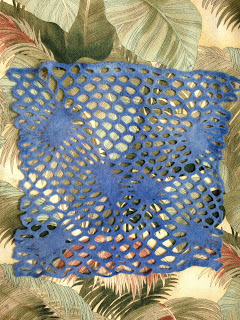 More dyeing, more undercolor possibilities and a brand new way to create the shaped resist for the final dyepot - PINS! and I'll say no more as to not destroy your anticipation when you come to the class. And my brand new fav-o-rite - the MOON scarf, also using resist blocks and mr. scissors to change forever how we look at needle punch merino batts. Again - shhhhh! Leon curled up and not very impressed at all about the new MOON. 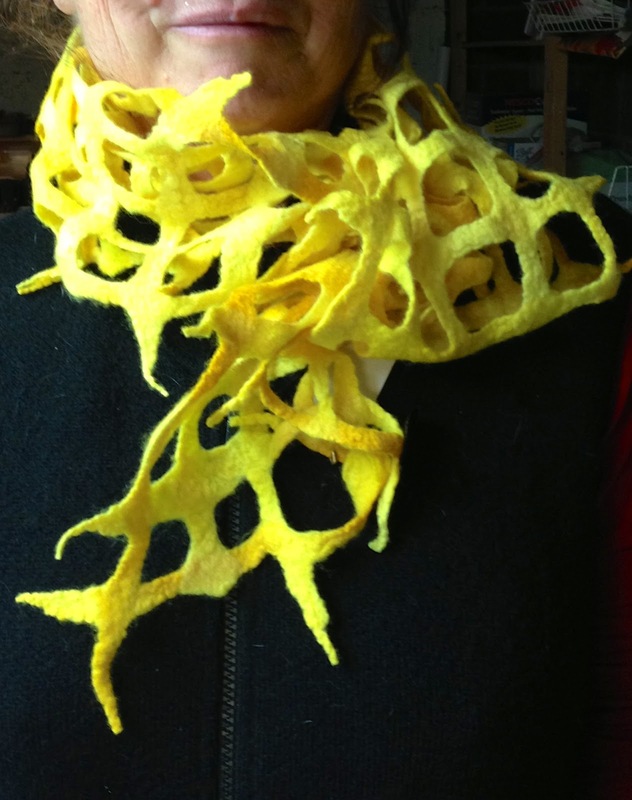 And of course I will always include my all-time favorite scarf, the olde AIREY FAIRY because it has so many possibilities and I feel obligated to share it will a new generation of felt makers. But I have a few ideas about that olde workhorse that may appear shortly in the workshops. The The BUBBLE BOA scarf is one I've done many times too, but with a dyepot in the room, so many possible outcomes are boggling the creative mind. about to be submerged in the wonderous resist dyepot. And where will these workshops be held? I know you can't wait to jump in the car or your private jet and come join us! Also check on my "upcoming workshops" for more information and contact information. 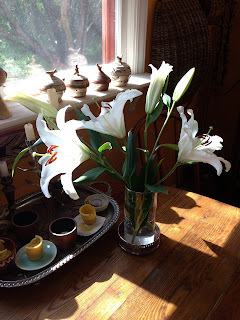 I finally found where I can get my favorite lilies. Life is sooo good. 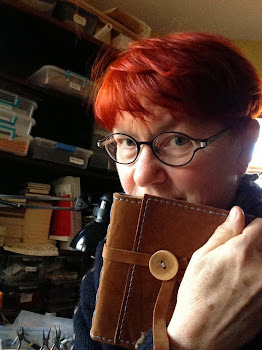 Always look forward to your blog posts, and hearing more about your felting, book arts, new areas to explore, and teaching trips. Hope to take a class this year or next. Chad, loving the scarf class at John C. Campbell! Thank you for your great instruction and for making it fun!